Having grown up in a family that hunts, wild game has always been a staple at our dinner table. Whether it is having some grouse poppers for a post-hunt snack or some burgers made out of venison or pheasant, we’re always consuming what we hunt. We’ve gone through numerous appliances over the years, from vacuum sealers, to food processors, to meat grinders. Some have been great & simply wore out, while others have been cheaply constructed & didn’t even make it through it’s first deer. For that reason, I’ve compiled a list of meat grinder reviews to keep you from making the same costly mistakes I did. 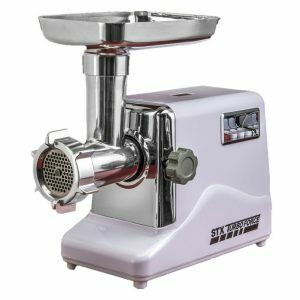 The STX Turboforce II is the very definition of a quality meat grinder for home use. With a patented Quad Air Cooling System, it is said to last up to 2 times as long as other similar-priced meat grinders. As far as features go, the Quad Air Cooling system is certainly worth it. Even before you open the box, it’s immediately clear that the STX Turboforce II is built with some serious quality, and they’ve thought through just about everything. Cleanup is about as simple as you can hope for with their stainless steel construction. The included foot pedal control is a great feature for meat grinders for wild game, especially if you’re grinding a lot of venison that day. This workhorse can grind up to 225 pounds of meat per hour. When compared to all other meat grinders on this list, the STX Turboforce II ranks as our top recommendation. Yes it costs a little bit more, but with the patented technology of their Quad Air Cooling System you know you’re getting something that no other meat grinder has. There are a lot of good meat grinder reviews for the STX Turboforce. Customers frequently cite the convenance of hands-free operation thanks to optional foot pedal control. Just like us, they’re commonly using it to grind deer for further processing & were impressed with the power. We also did a full, in-depth review of the STX Turboforce II 4000, which you can read here. The first generation of the STX Turboforce made the list because it is still currently the best seller on Amazon, likely due to the price. However, we feel that it’s days of leading the pack are coming to a close with the 2nd generation – the STX Turboforce II – introducing some incredible improvements. Obviously when compared to the STX Turboforce II the features are somewhat limited, but this is still one of the best meat grinders out there today. Featuring an easy to clean construction and a solid track record, the first generation of STX Turboforce is a great meat grinder if you’re looking to save a little bit of money. There’s good reason over 80,000 STX Grinders have been sold across the nation over the last seven years. We also did a full, in-depth review of the STX Turboforce 3000, which you can read here. 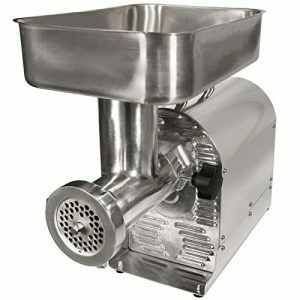 This high-power meat grinder by Weston is made to run smoothly for a lifetime and is certified for commercial use. The Pro Series is permanently lubricated and has an air-cooled motor with 120v, 60 Hz. It can grind up to 18 pounds of meat PER MINUTE, that’s more meat per minute than any other grinder on this list. If you’re looking to splurge on a machine that can last a lifetime, and grind more meat in minutes than most residential households could eat in a week, this is the best meat grinder to add to your kitchen. Thanks to its rugged durability, this model is considered one of the best meat grinders for venison. While this high-quality grinder is on the pricier side, as a commercial-grade machine it is worth every penny. After all, out of 184 customer meat grinder reviews, 82% of people give this machine 5 out of 5 stars. 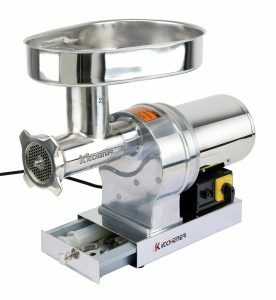 This commercial-grade stainless steel meat grinder can grind up to 840 pounds per hour without fail. This is in part thanks to its use of steel gear-driven mechanics and a maintenance-free air-cooled motor. Complete stainless-steel construction is rust-resistant and highly durable. Advertised for small restaurants and meat processing shops, this heavy-duty machine offers a powerful grinder that can handle just about anything you throw its way, from deer to pork and everything in between. KITCHENER added a water-proof switch and circuit breaker for safety; along with rust-resistant parts and a patented removable storage drawer for added convenience. 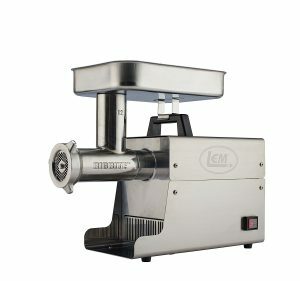 The LEM Products Meat Grinder comes in several variations and price points. The #12 .75HP model sits at the middle of the pack. It can grind up to 11 pounds of meat per minute and has a permanently lubricated motor for decreased grease formation, as well as reduced motor noise. The sleek brushed steel finish cuts down on fingerprints while adding modern style to your kitchen. Plus, the rifling pattern designed into the head pushes meat forward without as much pressure from the user. 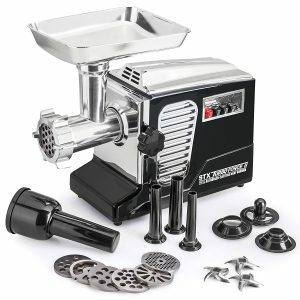 The 0.75 HP stainless steel Big Bite grinder that comes with this model offers a sizeable step up from other models in this series. For 1 HP, the price goes up by over $100, and for 1.5 HP the price goes up another $130+. The Amazon listing allows you to easily check out other models from the same page. 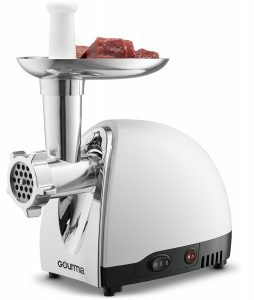 You won’t get as much power with the Gourmia GMG525 model, but you’ll get one of the best meat grinders for under $100. The Gourmia is 500 watts ETL certified and comes with metal gears and stainless steel blades. This machine is easy to use with simple on/off buttons and a reverse switch. The stainless-steel cutting plates allow you to easily make custom blends for fine, medium, or coarse grinding. At this price point you can’t necessarily expect a lifetime of nonstop meat grinding, but according to meat grinder reviews this affordable machine offers a lot of bang for your buck. 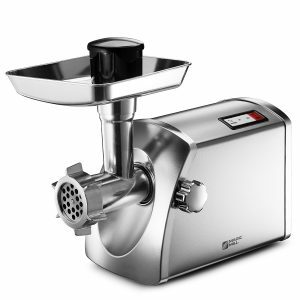 From pork to venison, this all-purpose meat grinder easily minces and grinds meat, as well as makes sausages. The basic control panel offers on/off/reverse/half/stop and reset buttons for one-touch operation. This is one of the best meat grinders for under $100 but you can’t expect miracles from a lower priced model. 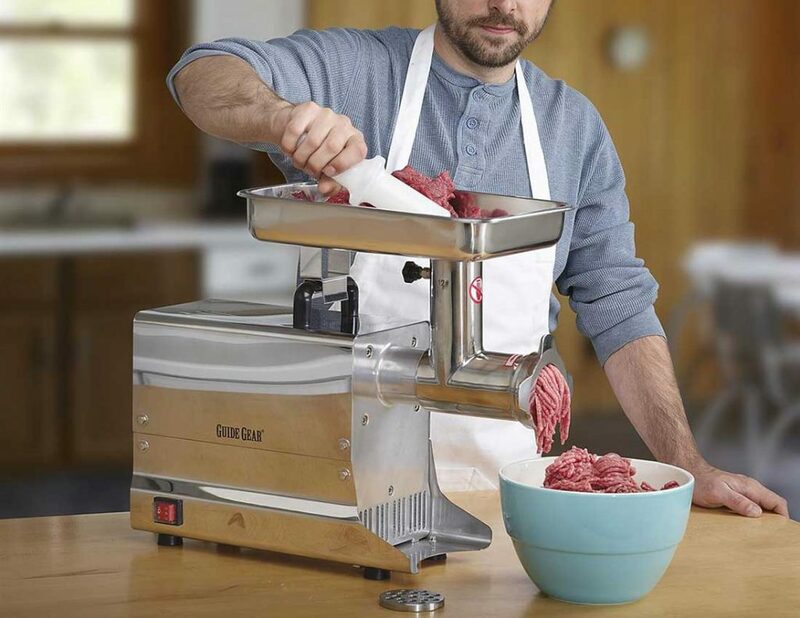 While other meat grinders on this list can process up to 12+ pounds of meat per minute, the Magic Mill MMG-3001 grinds up to 4 pounds per minute. This meat grinder remains a good option because of its heavy-duty copper motor, versatile attachment options, and a one-year warranty. The ALISKID Hand Crank Meat Grinder has better reviews than most other hand meat grinders, and it’s incredibly affordable. This lightweight pick-up-and-go grinder is made from high quality food safe materials that are durable to boot. The machine comes apart easily so you can clean all parts. Plus, the specially designed long handle helps make the process a little less laborious. While the powerful suction base keeps the grinder firmly in place on most dry and clean countertop surfaces. The ALISKID Hand Crank Meat Grinder is advertised as multipurpose thanks to its ability to grind meat, peppers, etc., while also serving as a pasta maker. Unlike the other best meat grinders on this list, the ALISKID Hand Crank model does not come with a sausage stuffer. With nearly 3,000 reviews, 61% of which are 5 stars, the KitchenAid meat grinder attachment is popular for good reason. The meat grinder attachment for KitchenAid comes with a coarse grinding plate and a fine grinding plate so you can grind everything from meat to smooth salsas. KitchenAid mixer attachments easily hook onto any KitchenAid Mixer, including lift or tilt models. Simply attach to the Power Hub on your stand mixer and watch as it uses the motor’s power to operate. If you already have a KitchenAid mixer, it’s more affordable to purchase a meat grinder attachment as opposed to buying a separate meat grinder. Additionally, this is beneficial if you’re short on space for kitchen gadgets. 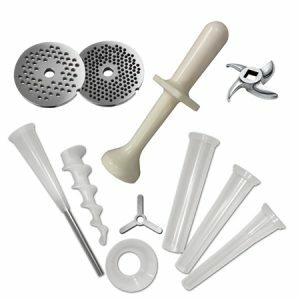 The food tray and sausage stuffer are sold separately but are compatible with the meat grinder attachment for KitchenAid. 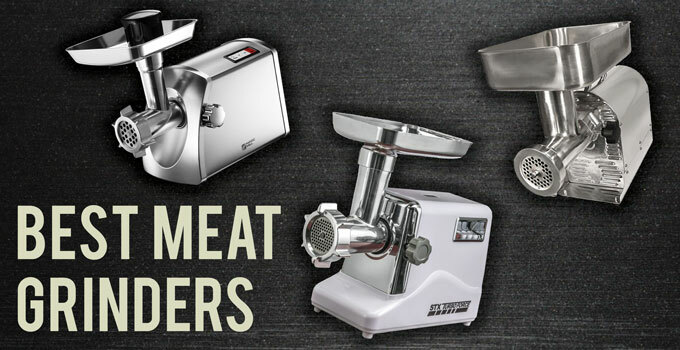 What makes a product the best meat grinder? There are a lot of things that can earn a product a good review, and the same goes for a bad one. To be clear we’re taking an outdoorsman’s (or women’s) approach to this ranking. If you don’t typically handle wild game you might disagree with a few of our points, and that is okay. The good news is that if one of these meat grinders can handle wild game, they can definitely handle whatever you have planned. The first item we looked at is pretty obvious: How does it perform when introduced to wild game? Grinding wild game sometimes means dealing with things that farm raised meat simply doesn’t have to deal with. We’re talking about everything from lead or steel BB’s in birds, potential small bone fragments in venison, or tallow in just about any big game species. As much as someone can try to make sure their meat grinder doesn’t have to deal with things like this, the reality is that sometimes things get missed & mistakes are made. Our view is that it shouldn’t result in you having to buy an entirely new meat grinder. How well is the meat grinder built, and will it stand the test of time.Â I’ve had a meat grinder fail on me in the middle of processing a deer, and that was all I needed to opt for quality in the future. Because of that, you’ll notice that we tend to rank some of the higher end options towards the top of our list. It’s no small chore to process wild game like venison, elk, moose, or boar. Trust me when I say that you’re going to appreciate the higher quality when you’re an hour and a half into processing your wild game. When we were compiling our meat grinder reviews this was a major factor. Every brand out there is going to talk about how their meat grinder is the best. That’s fine, but what features truly make the products better & which are essentially just a marketing gimmick. We take a look at these & evaluate whether they’re worth it or not. The same can even be said about the lack of features. Like my dad says: “Keep it simple, stupid!”. Less bells & whistles mean there are less opportunities for the product to fail. We kept that in mind as we put together each one of these meat grinder reviews. From sausage stuffers to options for different coarseness of the ground meat, there are a lot of different possible attachments for meat grinders that you can use. Realistically you’re probably only going to use one or two of them, but having the option is always a good thing. To be clear, we aren’t reviewing the quality of the attachments in this article. We’re simply indicating whether or not the options exist. Actual reviews for meat grinder attachments will take place in a different article. Anyone that has ever processed venison, elk, or other big game animal knows that cleanup can sometimes be the biggest task of the day. The simple nature of the meat grinder means it typically is going to be relatively difficult to clean. However a well thought out design can make things a lot easier to clean. Simple features like a stainless steel body, removable auger, and high quality plates will make a world of difference after the job is done. Imagine you’ve just decided to try to save some money on a meat grinder, and justified it based on the incredible warranty the company offers. They stand by their products, and that says something. Their lifetime warranty includes a full replacement if anything breaks on the meat grinder, regardless of what happened to it. Aunt Martha accidentally dropped it down the steps? No problem, just send it in and they’ll send you a new one! Had too many beers and thought it would be a good idea to somehow grind your empties?Â No problem, just send it in and they’ll send you a new one! All these scenarios sound ridiculous, and the fact that the company will send you a new meat grinder for any of them is incredible. And it’s a great selling point while you are browsing & trying not to spend that extra $50 for a better model. After all, money is always tight & that $50 can go a long ways. Now fast forward a month or two, and you just shot a nice doe to fill the freezer. You are going to use that meat grinder & vacuum sealer you just ordered on Amazon to process & store it, and can’t wait to get started. You spend an hour or two butchering the deer in your garage, separating the steaks, roasts, and trimmings, and getting everything ready for processing. Now it’s time to use that shiny new meat grinder you bought and saved a bit of money on. The first 5 pounds of trimmings go through great, but the grinder starts to sound a bit rough. You’ve still got about 10 pounds of trimmings to go, and after 3 more pounds the sucker stops, followed by a nice little puff of smoke. Well that warranty unfortunately doesn’t help you with that 8 pounds of trimmings you have left. At this point you only have 2 legitimate options. You can freeze the trimmings the way they are & grind them up after you receive the replacement. The other option is to run to the store & buy a replacement, at which point you’re realistically looking at being out another $150. Both of these options are time consuming and a major pain in the rear. As much as I wish it wasn’t, this is actually a true story for me (minus Aunt Martha dropping it down the stairs & attempting to grind beer cans, of course). After that I decided there are things that are simply worth spending a bit of extra money on to ensure I don’t have to deal with things like this again. That’s why I say a good warranty doesn’t make a bad meat grinder better. Yes, you’ll be able to recoup your investment if you send it back in. But you didn’t just spend 3 hours processing your deer to not finish it. Please take my advice and don’t try to save a few bucks just to end up with a headache down the road. This isn’t some gimmick to get you to spend more money. This is simply a guy that had a lower cost meat grinder fail, resulting in far more work than the money I saved was worth. I don’t mean to say that you shouldn’t trust a company with a good warranty. All I’m saying is to keep in mind that while you can likely get a replacement if your meat grinder breaks, it is still going to ruin your day in a pretty big way. The STX Turboforce II wins this competition handily as the best overall meat grinder on the market today. Between the range of attachments & the patented Quad Air Cooling System it’s going to be very hard to beat. When it comes to meat grinders, durability comes in at the most important thing on the list. The quad air cooling system has been tested & proven to almost double the life of the STX Turboforce II. Even without the incredible cooling system the Turboforce II would still finish as our top meat grinder. The addition of the foot pedal is an incredibly nice touch, and it’s very easy to clean. If you’re stuck trying to decide which model is best, you’re definitely going to want to buy this model. After taking a look at all the other options out there, we promise you won’t be disappointed.